Numerous studies have demonstrated that the diversity of a school directly contributes to the quality of its students’ education. Exposed to a variety of perspectives, students learn to think critically, to challenge their assumptions, and to explore alternative approaches and solutions to real world problems. We know as well that children grow best when they feel wholly safe and wholly welcome. Students bring their personal backgrounds and histories to the classroom and their classmates and their teachers are richer for that gift. It is out of this responsibility that we are proud of our community's work in Diversity, Equity, and Inclusion. An Affinity Group is a group of students and faculty linked by a common purpose, ideology, or interest. Affinity Groups play a vital role in ensuring an inclusive environment where all are valued, included, and empowered to succeed at White Mountain. Affinity Groups can provide a collective voice for students with common interests. The Diversity and Inclusion Steering Committee dedicated the 2017-2018 school year to educating the community about the importance of Affinity Groups and surveyed our community for Affinity Groups they felt White Mountain needed. Backcountry Sisters is a great example of an Affinity Group that meets the unique needs of our school community as it brings together women in outdoor sports – an underrepresented group within the sport community. Director of Diversity and Inclusion, Lawrence Alexander P'20, works with our faculty, students, and Diversity and Inclusion Steering Committee to foster the vibrancy of our diverse community while enhancing our equity and inclusion programming. “The NAIS People of Color Conference is the flagship of the National Association of Independent Schools‘ commitment to equity and justice in teaching and learning. Read more about what faculty memebers took back with them from their experiences at the POCC in Nashville." 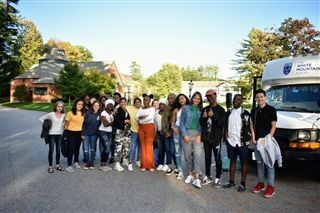 The LRSOCC is hosted yearly by Holderness School and is designed to recognize the unique needs, experiences, and challenges of students of color in independent schools, particularly in the Lakes Region area. Read more about Jaylynn's '20 expereince attending the conference. 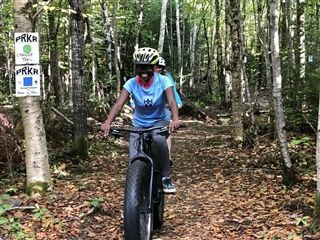 The Backcountry Sisters Affinity Group at The White Mountain School gathered together to learn, teach and ride local mountain bike trails with the generous support of Littleton Bike and Fitness.